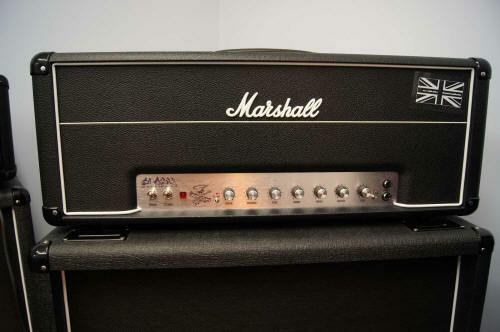 The AFD100: Developed by Marshall and Slash. 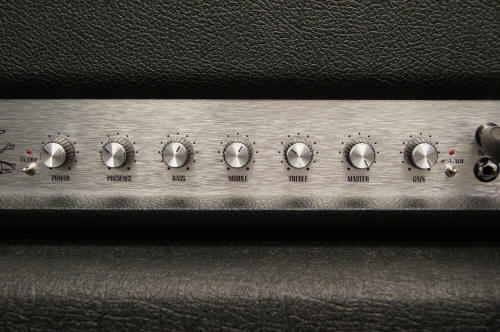 But will this amplifier make you sound like Slash? is the power scaling an improvement for Marshall guitar amps? NOTE - this is a VERY long review of the AFD100 Slash Amplifier. This review was updated after the initial review with comments from Santiago Alvarez, the amp designer at Marshall Amplification PLC. Santiago comments in red and my further comments in blue. The History section now includes part 2 from MisterMiniMite - an awesome document. The AFD100 amp from Marshall has been a very long time in coming (or so it seems) and I was waiting for this amp with baited breath after all the hype and talk about it from Slash fans, Marshall themselves and others. There is so much stuff floating about and often spoken on the internet about that elusive S.I.R #39 that the original appetite slash amp has gained legendary status. Check the #39 history. So how do you set out to make an amp that you have never seen? And how authentic will that sound and feel be to the original modified amp? It's a bit like Gibson recently who made a guitar 'in the style of Slash'.... actually the original guitar was not made by Gibson, but was 'based' on a Les Paul. In the AFD100 we have a similar situation - Marshall did make the original, but it was modified by others so is it a Marshall amp as we know it? No it is not. But (like Gibson) here's where it gets weird, they make an amp from something that they don't know what's inside! Its a great idea, but clearly the AFD100 shall we say is in the style of the SIR amp sound in my opinion. Heres the amp I received on 22nd December 2010 shortly after it came out of the box, photographed and then placed on top of a 1960B Marshall cab. As you can see from the photo, the amp is really a sort of mismatch of a number of amps - a 'plexi' style, a JCM800 style, old power and standby switches, two guitar inputs, 'fat' sides to the cab and of course the 'small' Marshall logo from that bygone era. And there's new too: The silver anodized brushed aluminum is new to this amp - this is the only amp Marshall make with this finish. Some reviewers (like Guitarist magazine January 2011) have called it 'snakeskin' - well maybe (but only just), if you are drunk or had one coke too many, but where I come from it isn't snakeskin. Theres just about 1 1/2 inches of faded snakeskin in the background on the front right hand side of the silver panel. It would have looked REALLY cool with that 'snakeskin' etching all over the panel. Also the font used on the lettering for everything is unconventional and while you CAN read it, I don't think it offers any aesthetic benefit to this amp whatsoever - in fact that font is ugly. It is the AFD album font as far as I am aware. Obviously there is much more to this amp than a few colour mismatches and fonts that don't work... but it would have been a nicer product in my view if the panels were gold, the logo was gold and that font was simply more commensurate with this amplifiers status. M-2010-49-0209-1 is: a UK amp, 2010 Year, 49 Week (November 30 to December 6), Day 2 (1st December) 09 Unit Number and lastly the production line (or this could be the run number - remember this was production run number 1. Checking the other guys serial above based on this analysis his amp is exactly the same except for unit number - so clearly the unit number is related to the units they built. MY OVERALL CONCLUSION IS THAT MY AMP IS NUMBER 9 AND HIS IS NUMBER 40 FROM THIS SAME PRODUCTION RUN. Of course I could be wrong. I have not seen this information or analysis anywhere else on the internet - it seems that Marshall don't appear to offer up this information to end users, but if someone knows better than my analysis and can PROVE it i will gladly update this info here. In fact the code is: year - week - sequential number - voltage/area code - your amp is 209th. Marshall said they were releasing only 100 pieces before christmas 2010 in the UK. I wonder what happened to the first 200 pieces? I don't doubt SA about the sequencing etc but it does raise questions about those first amps - unless Marshall decided to start off the numbering from 200? or maybe those are the 'special edition' amps up for sale at a premium? I would not be surprised. Time will tell. Footer Update - Santiago Alvarez has commented later 'the serial numbers, even if the UK amps were shipped first doesn't mean they were built first' - just for clarification purposes. OK lets move on a little. When I took the amp and photographed the inside I noticed a few niceties on the way. For example, gone are the screws that typically hold the back cover on the amp; these are now replaced with 'machine screws' with metal inserts in the back of the amp to take the screw. Long term this has an advantage that the screw is always going to do its job (how many times have you seen the back screws hanging out of those old plexi style amps) for a very long time indeed. This shows in my view that Marshall have spent time in over engineering the AFD100 amplifier where it matters. Metal inserts for the rear grille are being used already for several years. Not on the amps I reviewed; maybe I forgot; I'm getting older so that's my excuse anyway. Again that's standard Marshall steel used for a long time. It is 1.6mm thick. Look at the corner of the chassis and you can see what I mean; nice thick steel welded as necessary to make this chassis a really strong bit of kit. It was nice to see on this amplifier design some common sense. I noticed (as you can see in the above picture) that marshall have reverted back to installing a 'choke' on the AFD100 design. Typically on the newer amps marshall 'did away' with the choke and simply replaced it with a big fat resistor. Now if you know anything about electronics at all then you will probably understand that the resistor and the choke are two very different things. The choke is next to the big transformer in the above picture and the resistor is not :-). This 'choke' has measurements in 'henries' (something to do with the inventor) Joseph Henry discovered the self inductance) and a resistor is usually measured in 'ohms' (also named after the inventor/discoverer). (Ohm enunciated the principle known as 'ohm's law'. In fact the impedance of a 'choke', capacitor or anything else is measured in ohms.) I am not a wizard quite like SA but the chokes I bought were sold by measurement of 'henries' but I don't question SA, but MM sell chokes measured in 'henries' - SA will be right. This choke has a direct effect on the design AND the SOUND of your amp. If it did not - I am absolutely sure that Marshall would have installed a cheap resistor in its place. After all 2300 chokes are much more expensive than 2300 resistors! Yes, but the % of the price of the amp is still low. If a JVM has a resistor it is because when we designed it, for the kind of music it was mainly targeted, we consider that a resistor was more than adequate for the job. Hard to argue with - except to say that the choke does affect the sound in my opinion. I like amps with chokes! I carried out a choke modification on a JVM410H head and you could tell the difference in sound and some other subtleties so don't think that its just a myth that the choke affects the sound - it does. It's good to see that Marshall agrees. Inside the AFD100 it is VERY different than what would have been in that #39 amp. My view is that the original had the old hand wired circuitry a bit like what you see in this picture but maybe even older style than even this. 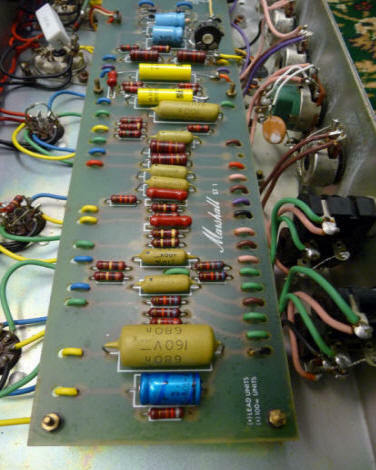 This type of board was introduced around 1973 but in that elusive amp it might even be an earlier turret board design. However, those days are gone (or are they?) and Marshall have made the insides of the AFD amp using current technology and techniques that simply were not available when the original amp was made. So below is an image of the AFD board as you get it today. This build also uses 'Dagnall' transformers for both the power and the output transformer. 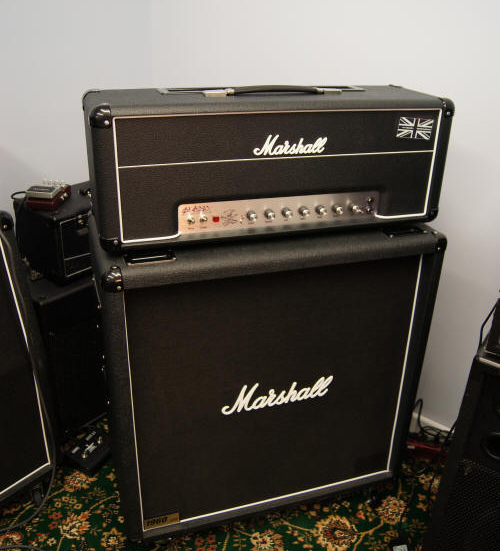 This brand have been around (it seems) forever and Marshall teamed up with Dagnall in the very early years of production. It is very likely that these transformers have custom made for this amp in the usual Marshall tradition. Output transformers are the same as the 1959's and the JCM800's but mounted horizontally. We used the same transformers in the JVM, 2203KK and YJM100 for example. The mains transformers are a variation of the JVM ones, which are beefier than the JCM800 ones for example. It's interesting to note the transformers are the same as the YJM100 amp. They don't often take a 'standard' transformer and just put that in. Here again we see Marshall deciding on things that affect the TONE of the amplifier and there are no short cuts on transformers. Most guys know that transformers contribute greatly to the sound of an amp and these will be no exception. Notice how they isolate the output transformer (the one on the right) from the rest of the circuitry with a metal plate - this will contribute to a quieter amp when just sitting there turned on with the standby switched on. That prevents the output coupling in to the preamp as they are physically close. One thing to note is that there are a number of fuses INSIDE the amp which you cannot get to unless you pull the chassis. This becomes a pain if one of those blows at a gig and you want to change it out just in case it was just an old fuse.. not important now, but later on down the road? We've put the HT fuse on the outside as that is the only one that should be blowing in case of output valve (tube) failure. The other fuses are mainly to comply with modern safety regulations. I suspect theres one there for prevention in case of surges. Power surges could then take out a fuse? If that is the case, and theres a power surge at the gig, well, at least you will know where to look. I noticed that the tone stack controls (the controls on the front of the amp) were all printed circuit mounted directly on to the tone stack board and had long extensions of the shaft to get to the front of the amp. Again no problem, unless yours is out of warranty and one fails. However, its pretty unlikely that this will happen so its no real concern. Sealed pots, we have been using them for years and they are very reliable. I never had issues with pots either; its just that a generic replacement might be harder to find if you are on the road and don't have a Marshall one. But I agree it's unlikely that these will fail. The main PCB is a double sided through plated affair made from thick fiber material in keeping with today's technology and this board should prove good long term. I did notice however that the tube sockets are soldered right to the board which could at some stage offer up a board issue because of heat. The transmission of heat by conduction through the pins is not too big as the pins are relatively small. Main heat source is convected and radiated, blocked by the chassis in a combo. In a head the heat tends to go up away, so the PCB would run quite cool and definitely much lower than the temperature it could withstand. Well SA is the designer and I'm not going to argue with him; if he does'nt know then no one does! Above is a video which shows the build of the amp under review. Integral to the amp is a feature called 'power scaling'. This allows the amp to output the same quality sound at reduced volumes and clearly, with so many guys playing guitar in the bedroom this is an important feature to have. This is likely to be of a similar design from a well known leader in this technology called London Power www.londonpower.com who originally invented power scaling in tube amps some time ago. This is a great feature and Ill talk about this later on when we consider the operation of the amp. In fact Santiago (who was the primary designer of the AFD100) said "our principles are very similar. Both our system and Kevin's (London Power) are based in some previous works to which Kevin added a HT control that we didn't implement. On the other hand, apart from the input signal we compensate the power amp feedback and we added the biasing to the system". Like I said the power scaling has been around for a while with little implementation that I am aware of - but it is reasonably clear that these two companies have spoken about this subject. Another neat feature is the 'auto' biasing of the power tubes. The AFD100 uses 6550 tubes (probably originating in China in this amp as supplied) (I am not sure if Chinese or Russian) but in fact it can use near enough all octal base tubes with just a few exceptions - so you can use say 2x6550 and 2xEL34 and the amp can basically solve the issue of impossible to bias tubes. Its worth noting though that this feature is NOT completely automatic in its operation. Firstly you have to look at a table in the back of the manual that refers to input power AND bias voltages for different tubes. Then you set a preset on the back of the amp to match the tubes fitted and lastly run through an automated feature where you hold the loop switch on while turning on the amp. There is a reason for making the feature semi-automatic. We wanted the amp to be as close as possible to one with standard bias so the natural dynamics are preserved. There are some other systems that monitor the current while in use and adjust the bias continuously but that would be different from a classic biasing topology. The fact that you need to start the biasing procedure could be understood like biasing the amp once and then closing the cabinet, having the bias fixed to what ever we wanted. My view is that this procedure works so it's no real deal breaker that it has to be 'initiated' in the first place - a massive improvement over most amps. The amp will then and only then bias itself according to what you set the preset to so its not quite 'completely automatic' but is a massive improvement over previous Marshall biasing methods. In some ways this makes the Mesa Boogie answer to biasing a little redundant. The AFD amp has a switch to switch to Slash's current amp sound #34 (yes that's right not #39). It is likely that this switch will modify the tone stack in some way on this amp. You will notice a difference. The tone stack is the same. It removes a gain stage and reconfigues the existing gain stages. Well what's all that about I hear you ask? The image shows a Slash era amp that may well have been the #39 amp that everyone and their dog is looking for. Notice the pull switch on the front. That modifies the tone stack in that amp and makes it sound very much like #39 (i.e. the non #34 mode on the AFD100). You will notice in the non #34 mode on the new amp that there is increased treble and presence on the amp - and its REALLY more than on an average amp. I suspect that the AFD100 amp has its tone stack modified similarly to the amp shown above - maybe with other modifications as discussed elsewhere on this site. None of that is rocket science, but it does also increase the overdrive of the amp (Marshall actually confirms that in their videos, online and in the manual of the AFD100). So maybe the 'magic' in the original Slash amp (apart from Slash playing it) was a simple tone stack mod - highly likely, given the sounds from the old amp shown here and the AFD100 similarities in sound in that respect. Like I said - the gain in that old amp is increased dramatically and it can cut your head off with treble and presence being overly abundant at 20 paces. But let's get back on track with the review of the new AFD100. The difference in tone from #34 to AFD can be clearly heard by listening to Slash's song 'Back from Cali'. In his solo album he used the #34, in the iTunes session the AFD. I chose that cab because it has volume (no not sound volume but rather cab size volume) and I wanted to get a reasonable bottom end out of the amp. I used the 16 ohm connector on the amp and the cab. Its worth mentioning that the amp supports all the ohms ranges you will need i.e. 4, 8 and 16 ohms. I also used a monster cables speaker cable. While not cheap, these cables are almost indestructible, they are really fat (as they should be) and I'm sure they offer a great connector between the amp and the cab. There are others, but look for a fat one! (no not the girls). For my first foray with this amp I used an Ibanez RG550LTD (and later a Les Paul), an original Cry Baby pedal and a decent guitar cable or two. One thing to note here was that I usually use a Fulltone Clyde Wah pedal. That pedal has a gain structure within it (check out the review on this site) and I can tell you that the Clyde wah and this amp did not get on too well. Right from turning the amp on I could tell this pedal was not going to do it for me - so I used the Cry Baby. Indeed in all the videos I have made of this amp the Cry Baby was the pedal of choice for this amp. Actually I am a bit of a distortion freak and I admit it. So what did I set the amp to before I switched on? Yes that's right - I REALLY am a drive freak. Actually I did turn the amp on with master and gain at 9 o clock, but that was just to confirm everything worked - it did. I proceeded to set the amp up as above. Actually it's not entirely true. Once I had the amp running in AFD mode I rapidly turned the presence to 8 o clock and the treble right off. Why, I hear you ask? Well the treble coming out of the amp was cutting my head off. At first I thought the wah pedal was the cause but that was not the case. Its no problem once you are used to it, and those settings above are what I used to record all the video. I also tried the #34 mode out. That gave a more subdued and more smoother guitar tone. Now some reviewers have suggested that the #34 mode is better for chords... poppycock. This amp (once you get used to it) sounds awesome for lead guitar in ANY mode and indeed its the same with rhythm guitar - its just a ball breaking awesome amp sound. If you want that old PLEXI sound but at manageable volumes (strike that out - should have been ANY volume) then this amp can do it. If you want a JCM800 sound (all of them) this amp can do it in two flavors - a modified amp (the AFD mode) or another modified amp (the #34 mode) in either case, some shuffling with the tone controls and gain structure will have you with that sound in less than five minutes. Compare that to a HD500! Actually don't waste your time - there is no comparison. UPDATE: Do bear in mind that this amp is VERY toppy - in fact the most toppy guitar amp I have played through for some time. It may be good for you - it may not. Remember because its basically a one channel amp the tones once set will not change themselves like on other amps. The problem I found was that if you get a great sound in one setting, when you hit that tone shaping the sound changes dramatically. One channel amps can be hard to get right. That Treble and Presence control on this amp is everything. Remember I told you on this update. Now I'm not a player that plays 'Slash' music so don't look for any! but there are some nice enough tones on there as examples of the amp. If you back off the guitar in any of those modes this amp cleans up in a nice sort of way. Check my video - sound starts of on the first clip (using Les Paul Spotlight Reissue) with superb sustain that bleeds through to the next note - I could play with that sound all day. Clip two (Spotlight Special Again) backed off the volume and that gave me a more laid back lead tone that was still as good as any Marshall I have ever played through. Later in this clip I turn the guitar volume back up to the level of the first clip. Clip three did a similar thing with an Ibanez RG550 - the volume was down initially and I turned that up to show some sustain at about 2:48 to 3:10. I then introduced the Cry Baby pedal - awesome sound. You will notice how the guitar sustains more at this time - it really sounded great especially in the studio. Clip four (from 4:00 onwards) shows a heavier rock sound while I played 'Timeport' from my 2007 album 'Eniac' downloadable from iTunes etc. (that's the plug over :-) ). This is a far more aggressive style and was in AFD mode. At about 4:58 you can hear that chunky sound - I love that sound on a Marshall. At 7:50 there is some tapping which just rolls out of the amp at those settings with the Ibanez fitted with 'Vai' pickups. 8:20 shows some rhythm on the track to the end. Clip five (8:36) is basically a short take on 'Black Magic Woman'. Its a laid back Santana style. You will notice right at the start that there is feedback (of the bad type) and I quickly backed off the volume knob a little on the guitar. I did later turn it back up. This clip used a Gibson Jimmy Page Les Paul from 1996. Clip six (9:43) was a backing of 'Jungle Strut' from Santana. Obviously its my take on the lead guitar and not Santanas but it does drive the amp quite hard with extended sustained notes. I also use the Cry Baby pedal to drive the amp even further. The JP Les Paul was used on this clip. At 10:48 I tap the guitar HARD to the end of the clip. The sound in the studio was really awesome. At 11:10 I discuss some of my basic views about the AFD100 and just how much I was impressed you will have to watch the video to find out. While reviewing the amp I did check out the SERIAL effects loop. If you plug nothing in to the loop you can use that pedal on the floor switch to give the amp a boost for solos or indeed a reduction in output depending on how you set the adjustable control knob on the back of the amp. I'm just glad its a serial loop because you can get in to some issues on parallel loop equipped amps. This loop worked well. I installed a HARD WIRE Reverb pedal in the loop, switched it to a nice reverb and hey presto a fantastic reverb sound. You can of course use rack kit for effects and if you use a GCX switcher (or switchblade - which I may review soon) then you can feed this amp with many great effects. I did talk about this earlier but just wanted to confirm that this does work surprisingly well. Just one thing, its not quite like a regular knob for control. This aspect of the amp is being clearly controlled by digital means and probably with embedded firmware. Marshall say that the sound path is completely non digital (i.e. analogue) and I believe that to be true. Yes, the sound path is 100% analogue. The digital control shows itself in the use of the power scaling knob. You don't get a regular smooth change on power - you will notice that its more of a 'stepped' change in power as you turn the knob. Its a weird effect the first time you use the power scaling knob and one which I thought I should mention just to confirm that your amp is working right if you hear that (and you will). The reason for stepped change is becaise the change in output power is followed by a change in bias. By fixing the power levels we can properly bias the amp in each step for the best tone. Doing it this way we don't have to follow any relationship between power amp voltages and bias, we simply bias the amp wherever we want and that allowed us to go down to 0.01W which is 1000 times less power than 100. We also considered that 21 steps are good enough to provide a rather continuous change in power without an interminable biasing procedure. Bear in mind that every step is biased several times to average and balance the amplifier properly, so increasing the number of output settings would make the biasing procedure way too long. The power scale is logarithmic to provide a linear change in volumen. Linear power scale would feel like an abrupt change followed by no variation. SA has the word on this - I could not have put it better myself :-) - whatever SA says on this I believe! I have used some amps in my time as a guitarist since 1968.. probably most (if not all) Marshall tube amps at one time or another so I have some really good things to compare this amp to. When I watched this amp being developed my thoughts were 'well, I'm not a Slash fan, maybe this amp is not for me'. But as I continued to see the enhancements fed to the public this amp started to intrigue me. One of the reasons for buying this amp was that it was actually designed as a sort of hybrid amp with all those Marshall tones in there that COUNTLESS world famous guitarists have used since the end of the sixties right through the most important times of rock guitar. Indeed, no other brand of amp comes close to the Marshall history and heritage (or sound in those days) no matter what anyone says. So even though this is a 'Slash' amp I ordered one. The truth is that this is NOT just a Slash amp - this is a Marshall amp that has been effectively modded by Marshall themselves - now THATS what this amp is all about. Forget that this amp is a one channel amp, forget that its big, heavy AND expensive, forget that there's no real 'clean' coming out of this amp. Those are EXACTLY the reasons why you should own one. Except for the price! but limited runs do cost money. What's the score of this thing out of 10? So my overall score for this amp is actually 10 out of 10. Trust me - I'm not someone who gets paid to write reviews. Indeed this review was written over about a week of playing, messing around with and simply typing - effectively using up my 'spare' time in the effort - and that's something I don't have a lot of. I don't get paid one penny. So what's my review worth? I'll tell you. Its worth a thousand times more than the dealers, the magazines, the manufacturers, the HD500 guys who think they know what an amp sounds like and so on and so on. Take my word for it - if you play rock guitar (no not that heavy modern detuned stuff - you want an E670 for that) in the style of any classic and more melodic stuff then this amp will suit you down to the ground - and it will not wake the neighbors up if you play in the bedroom as many guys do. Simple. There are just 2300 of these worldwide. If you live in the UK its easier to get one. If you live anywhere else you really should have to look around a little or you are seriously at risk of paying more for one in the future. I'm sure these amps will increase in value and in three or four years time you will really wish you had bought one. Actually that's a lie! If you go to a gig and hear one of these you will wish you had one right now. Final score 8 out of 10 or four stars if you want it that way. Its one of the VERY few items I have ever reviewed with a result of that original* score of 10 out of 10 (*this score was later reduced for reasons of the treble output on this amp being very high. Last time I was as excited with an amp it was an Engl E670 and before that a TriAxis and 2:90 all of which remain world leading amps. Now add the AFD100 to that list. I hope you liked this review - its long, but don't forget to take a look at the AFD100 pages on this site that show aspects of use of the amp and offer general advice for users of this amp. 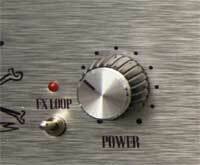 Check it all out : AFD100-Amp here. And don't forget to check out that 'history' page kindly written by MisterMiniMite - he did a really great job of that. With these enhancements from Santiago Alvarez from Marshall Amplification PLC I think that the review has been improved, and offered an insight by the designer himself. SA seemed to like the original review so I guess I got something right!